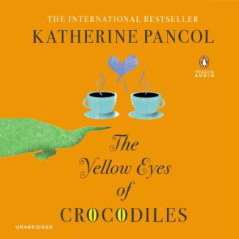 When her chronically unemployed husband runs off to start a crocodile farm in Kenya with his mistress, Joséphine Cortès is left in an unhappy state of affairs. The mother of two is forced to maintain a stable family life while making ends meet on her meager salary as a medieval history scholar. Meanwhile, Joséphine’s charismatic sister Iris seems to have it all—a wealthy husband, gorgeous looks, and a très chic Paris address—but she dreams of bringing meaning back into her life. When Iris charms a famous publisher into offering her a lucrative deal for a twelfth-century romance, she offers her sister a deal of her own: Joséphine will write the novel and pocket all the proceeds, but the book will be published under Iris’s name. All is well—that is, until the book becomes the literary sensation of the season. This was a delightful novel – funny and entertaining, lots of characters and a multitude of subplots. Once I got all the names straight and the relationships figured out the story began to flow at a quick pace. The individuals are so unique and well-developed I didn’t have any problems remembering who was who. The main plot revolves around timid, reserved Joséphine and her transformation into a stronger, confident woman. Surrounding her is a large cast of quirky characters including Iris, her outgoing, charismatic sister; her two daughters, Hortense and Zoe, polar opposites themselves; her worthless husband Antoine – the guy with the crocodiles; Luca, a hot guy she meets at the library; her mom and second husband Marcel and his mistress; Shirley, her neighbor, a woman with a secret of her own; and more. Characters, plots and subplots are intricately woven together and, after a few unexpected twists, most of the stories wrapped up neatly, although a few plot lines were left hanging. I was sorry to have to come to the end of this novel and was happy to learn that this is book one of a trilogy. The original novel was published in French and books two and three do not appear to be available yet in English. I found the translation very readable/listenable – only a few awkward phrases here and there. If anyone’s read it in French feel free to comment. Narrator Ellen Archer does a great job of creating different voices for each of the characters and I was able to identify many of them by voice alone. The large number of characters introduced quickly in the beginning of the novel could make this a challenge for the listener. The chapters are fairly long with frequent changes in characters and place. I find audiobooks easier to follow when there is a new chapter when the scene changes, but that was not the case with this book so closer attention to detail was needed. I wouldn’t recommend this as one’s first audiobook but for those comfortable with the format I definitely recommend the audio. Source: Review copy provided by Penguin Audio. The minute I first heard about this book I put it on my list. It’s sounds like a fun read. Leslie, this sounds really entertaining. I’ve vowed to listen to more audiobooks this year and will put this one on my list as well. Glad that helps. I added the audio listening level rating because some audio books are much easier than others for newer listeners. I’ve got this in print and I’m really excited about it! This sounds fun to me –nice review. Glad you enjoyed this. I have the book on my shelf and you make sound better than I expected. Good news! It was a pleasant surprise. I didn’t know anything about it other than the publisher’s summary when I accepted a review copy. I first heard about this last May at BEA. I came home with a copy all excited. Then I got a copy on audio and was all excited to get listening. Then … it’s still on my list to read. You’ve gotten me interested in it again! I got an ebook of this recently. But I’m even worse at reading my ebook TBR than I am for my real book TBR. I hope I get to it soon. I have the same problem! If I don’t see the physical book I tend to forget about it. I’ll be reading this one soon, so I’m glad to see you liked it, but I had no idea it was part of a trilogy! When I accepted a review copy I didn’t know about the trilogy either. I found out when I logged it on goodsreads and saw “Josephine #1” listed next to the title.